When we go to the gym, we’re there to sweat it out, to feel better about that extra slice of pizza we ate last night, and/or to just feel like we’re investing some time into self-care. What’s not top of mind? Our beauty routines. But while we may not apply a face full of makeup before a workout, we do often head straight to fitness classes after work. And it’s rare that we do a full double cleanse or even a quick wipe with a towelette to get rid of the day’s statement lips and strobed skin before walking into spin class. It begs the question—are we ruining our skin while caring for our bodies? “Heavy makeup may trap sweat and oil from leaving your skin,” says dermatologist Joshua Zeichner, MD, director of cosmetic and clinical research at Mt. Sinai Medical Center. “In some cases, this can cause irritation and low-grade inflammation or even acne flare-ups.” But that doesn’t mean you have to go completely bare-faced. Below, Zeichner and pro makeup artist Ashleigh Ciucci give us their skin-healthy tips for working out, whether you go to gym straight after waking up fresh-faced or you can’t live without your mascara. But how do you do that without asking for a zit attack later? Both Ciucci and Zeichner agree you should swap heavy foundations for lighter tinted moisturizers or BB creams. Another option is Almay’s Healthy Glow Makeup + Gradual Self Tan ($13). Not only does it contain SPF 20, but it’s also a hypoallergenic, medium-coverage formula that, with daily use, leaves behind a subtle tan so your skin looks good even after you wash it off. If you typically use setting powder, Ciucci suggests concentrating on just the T-zone. “The less texture on the skin, the less likely it is to melt off,” she notes. And rather than touching up with more powder throughout your day, use blotting papers—that’ll mean less makeup to sweat off later. If you wear mascara to the gym, you’ve likely experienced the highly scientific phenomenon known as “raccoon eyes.” And if it’s not sweating off, it’s flaking or stinging your eyes. But this doesn’t have to be the case so long as you’re choosy about your formulas. For this reason, Ciucci suggests tube mascara. Tube formulas wrap around each lash, forming a protective coat that’s not only easier to remove later (sliding off versus melting down your face) but also less likely to sweat off. (Note: Waterproof formulas will also do the job.) Our pick is Almay’s new One Coat Mega Volume™ Mascara ($7). You’ll want to wear it even when you’re not working out because the unique megaphone-shaped brush lets you load up your lashes with product. Then you can use the flat end to brush it through, and the tip to separate and fan out your lashes. It's also hypoallergenic and ophthalmologist-tested—i.e., suitable for even sensitive eyes to wear. Whatever makeup you decide to wear, one thing is certain—caring for your skin post-exercise is crucial. 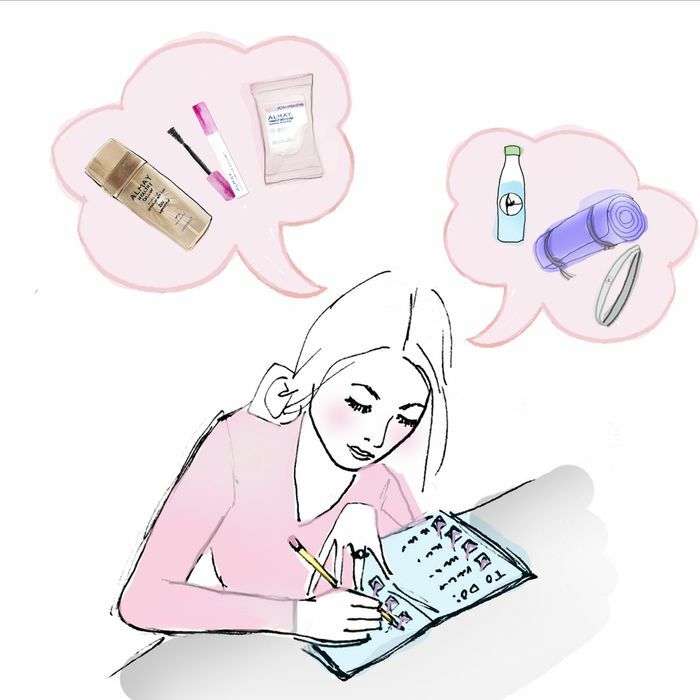 The best option is to cleanse immediately after working out, but if you prefer to wait until you get home, using a makeup-removing towelette, like Almay’s Ultra Hydrating Makeup Remover Cleansing Towelettes ($5), is a good alternative (and they’re easy to throw in your bag). They’re also super-soft, while still getting rid of heavy-duty makeup like the aforementioned waterproof mascara. At the very least, Ciucci suggests dabbing away excess oil and sweat with blotting papers—or her personal trick, toilet-seat covers. Once you’re ready to wash off your makeup, you’ve got to be thorough to avoid breakouts. Both Ciucci and Zeichner say double-cleansing is necessary. “First, use an oil-based [or makeup-removing] cleanser to remove dirt and oil,” says Zeichner. “Next, use a foaming cleanser to finish the job and hydrate the skin.” Our favorite pairing? Almay Makeup Remover + Cream Cleanser ($5) and Almay Makeup Remover + Foaming Lotion Cleanser ($5). We also suggest using a detoxifying clay mask or pore treatment. Ready to be kinder to your skin? The first step is shopping the full line of Almay products.